Oh, we’re not done with the fireplace/Christmas/Asthma Girl question just yet. If I’m going to recreate my internal debate about woodburning fireplaces here where you can read it, I guess I’d better also include information about lessening the particle pollution from your wood fire (and mine), should you find yourself in the same position. Here’s the thing. Burning wood requires 2 kinds of precaution–one to avoid triggering your child’s asthma with indoor particulate pollution and the other one for ensuring your community’s good air quality. 1. Always burn dry, seasoned wood. 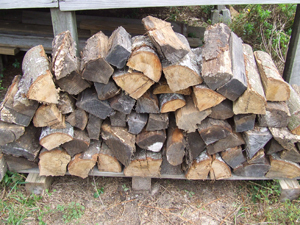 Damp wood creates more smoke and does not burn efficiently. 2. Always clean out the ashes from your old fire before you build a new one. 3. Keep the fireplace doors shut. Using just the screens lets more heat in your house, but it also lets in more particle pollution. 4. Keep the flue in good working order and make sure your chimney is clean. Just don’t clean it yourself, please. Call a professional. 1. Never use a woodburning fireplace as your main heat source. It’s just not efficient enough. Most environmental sites suggest using woodburning fireplaces only on special occasions. 2. If you want to have wood fires more often than that, look into EPA certified fireplace inserts that help your fireplace burn better and pollute less. What they do is convert your fireplace into a heat source that mimics the cleaner, more efficient EPA certified woodstoves. 3. If you’re building or renovating a home, choose a natural gas or propane fireplace. Really, neither solution is perfect. In option 2, a woodburning fire is still a woodburning fire, filter or no. And natural gas and propane may burn cleaner and produce fewer airborne particles, but they still come from dirty fossil fuels (propane is a petroleum derivative). Choosing a fireplace that burns non-renewable fuel over one that pollutes more feels counter-intuitive to me, like trading one evil for another, although there’s no question that option 3 is the better choice for asthma. Know what I’d really like to see research on? The impact of burning environmentally friendly wood alternatives like the Java Log in an EPA certified fireplace or woodstove. That might be interesting. Unfortunately, I doubt many people–including me–could afford the logs at $3.29 a pop. City of Palo Alto website. Thanks for the tips. We have a real fire and burn a mixture of coal and logs. It’s great having it burning away when it’s cold outside, but we’ve decided that once we’ve worked our way through the contents of the wood shed we’re having a natural gas “real flame” effect put in. Much cleaner and less work for me (partner doesn’t clean it due to his asthma!). Hey, no problem. Thanks for stopping by! I don’t blame your partner for not cleaning out your fireplace–I don’t even allow my kid in the same room when we do it. If I were staying in this house for any length of time, I’m pretty sure I’d make just the same modification you are, although I DO hate the fossil-fuel aspect of natural gas. But what can you do? There aren’t really any perfect solutions with asthma. Thanks for this. I love, Love, LOVE wood fires. We don’t have a wood-burning fireplace at our current house, sadly. But if/when we move or build it is on my list of must-have or must-be-able-to-do. Now that my 3-yr old apparently has “RAD” – which may or may not progress/be asthma – that could affect the whole wood fire thing. I hadn’t thought of that. (I know it’s obvious, but still I hadn’t put the two together in my head). This weekend we’ll be at my parents for Christmas tree decorating and chances are there will be a wood fire burning. I’ll watch to see how it goes, and be sure the pack the flovent & rescue inhalers. Andie, I know just what you mean. There’s nothing quite like a wood fire, unfortunately. Since my daughter was diagnosed at 2, we’ve been dealing with asthma for almost 7 years now and I STILL have to stop and think, *Oh, wait a minute. This might set off her asthma* practically on a daily basis……. The fun just never ends, lol. Good luck this weekend! I hope he DOESN’T flare and you guys can enjoy the visit. Burning coal and burning wood both release particles and chemicals into the air, and any ashes/dust can irritate asthma, too. We have a woodburning fireplace, and I can tell you that my daughter CANNOT be anywhere nearby when we’re cleaning the ashes whether cool or still warm. She immediately starts coughing when the ashes get stirred up, and coughing is her major flare symptom. We just moved into a house with a fire place . . . and wouldn’t you know it, my daughter’s asthma started flaring up. We are now looking into the correlation between wood burning and asmtha. thanks for you input. homemade carboard logs youtube has diy videos. wood is God made, not man-made. “pollution” from wood is invented by the uber riche to sell more propane, just like nylons in the 50′s-60′s took over the country because they were making them money and hemp was stronger, but illegal, not for health reasons, for money reasons. alcohol and tobacco KILL and DESTROY citizens of the US every single day, but they are legal and advertised killing people like me with severe asthma under the stress of constant smoke exposure everywhere. why? MONEY. it’s all about them making profits off petroleum and propane right now. newest rip-off fad. those are the things i thought of in the 2 minutes it took me to write this post. if i actually thought about examples, i could come up with a dozen more ways the uber riche, politicians, and corporations effect laws and “dangers’ and rules that line their pockets while we write articles about how “bad” trees are now. beetles. invasive exotic insect pests that foreigners brought here to ruin more of our way of life. this country is going to hell in a handbasket. whoever is in charge of these nonsense games needs to go take care of the beetles and fine the powerful rich jerks and leave the people alone. and leave the darned trees out of it. i have asthma and i LOVE campfires and fireplaces and if i die sitting by one peacefully blissfully happy, then sobeit, but my burning real wood that comes from God planted trees is NOT the cause of anything bad that happens. people destroy this planet by the creation of man-made money-making schemes. AND PROPANE EXPOSURE KILLED MY DOG. it makes me sick. i hate propane and it is FAR WORSE than trees wood, in every way. “clean” yeah right. until the next big thing that will make them more money comes out and they ban propane too making people re-buy everything all over again, as always. Km, tobacco is God-made as well, and it’s also a “natural” biomass smoke, just like wood. In fact, woodsmoke and tobacco smoke share most of the same mutagenic, carcinogenic and toxic compounds. Only woodsmoke has them in much, much greater amounts. I assume (I hope) you don’t blow cigarette smoke in your asthmatic child’s face? When you burn wood, it’s not much different. I’m an adult with asthma — in fact, everyone in my family has asthma, including my pets, thanks to our neighbors’ love of wood fires. I deeply resent the misery and increased medical costs we live with, so our neighbors can indulge in a highly polluting practice that should have been outlawed in residential areas years ago.